Aha! 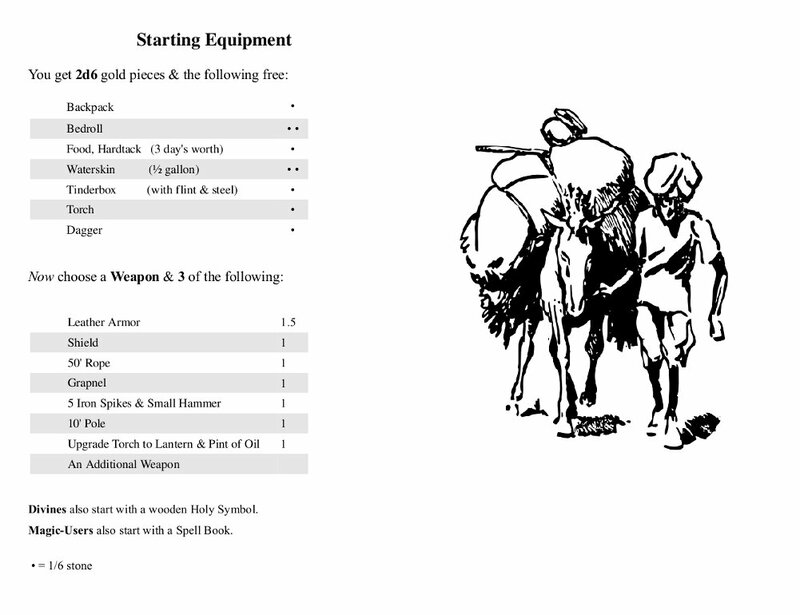 Starting equipment pack is a really good idea. I'll be adapting it for one-shots myself. Great that it might be helpful. 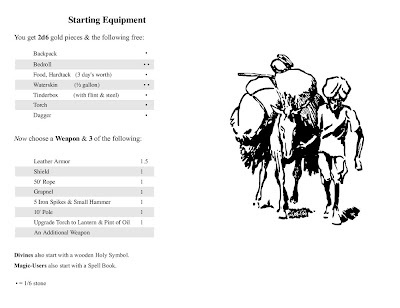 The idea of the fast pack isn't mine (showed up in some TSR modules) or even this version, I think it is Lord Kilgore's. I love pre-made packs for the players. It helps everyone to grab the gear they want and begin playing quickly. 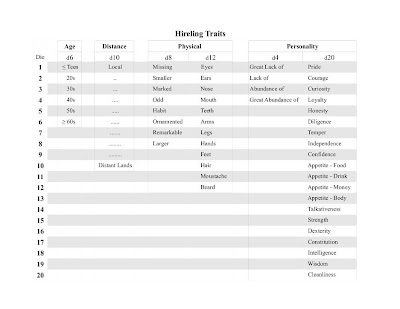 And I also love charts where you roll all the dice and check the results as a whole. 2 for 2 here. Great post. Instead of 'remarkable', maybe go with something unambiguously positive? "Good-looking" might work, but "well-favoured" has a certain Gygaxian archaism to it. Either one would certainly set it apart from "odd" while still keeping something of the original intent about it. Thanks - these will work nicely for when my wife finally rolls up some characters tonight. 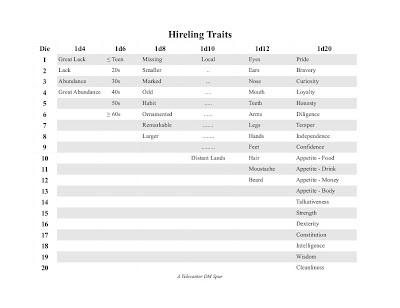 I like what you did with the hirelings chart too and think it works better now. But check your first PDF link at Squid above (I also have an account there - small net huh?) - It's returning an error. Acch, sorry, was gone playing 4e. The link is fixed now. Oh, drnuncheon, "beautiful" could work, I was also toying with the idea of "diseased." I decided to take the starter pack idea and add lots a bit of flavor for my one-shots. In essence it's a way to cut down on shopping and getting right into it: Character Generation Shortcuts. Thanks, for sharing Alex, that's cool. 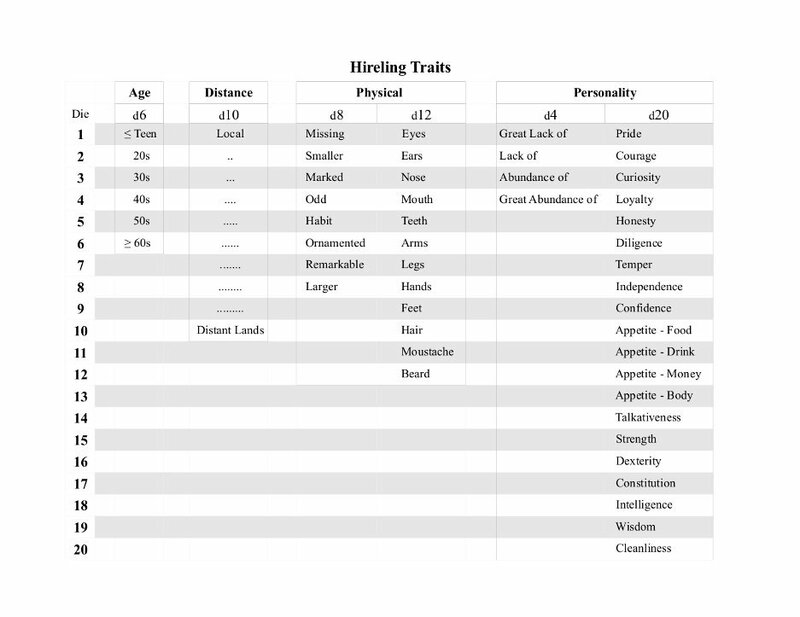 One of my players has taken to rolling on my hireling traits chart to give his own character some flesh, so there is definitely a craving for that. I think what interests me most is the recent events; they seem a perfect balance of answering how did I get here, without getting too free with telling players who their character is. I think 'remarkable' and 'odd' are good as-is. They just denote different levels of strangeness (which could be positive or negative). I'm interpreting 'Odd' as the more minor of the two, for anything that makes you stop and notice it with a "Well, would look at that." reaction; while 'Remarkable' is for things that make you run to find your friends and drag them back while shouting "You have to see this!"